For mountaineers, being in Nepal feels like being a kid in a candy shop. 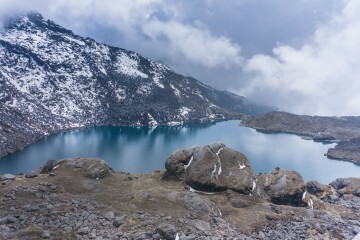 The only problem is that climbing mountains in Nepal is expensive. 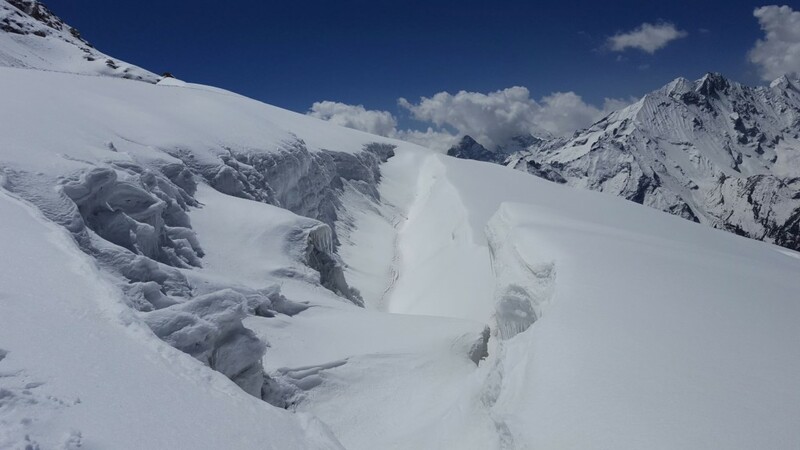 The Nepal Mountaineering Association (NMA) classifies peaks into “trekking peaks” and “expedition peaks”. For both categories there is a lot of paperwork to be completed, and a large amount of money to pay in permit fees. 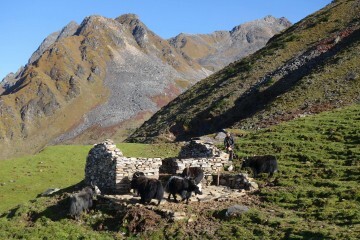 Back in 2014, the NMA eliminated the fees for trekking peaks below 5,800 metres. While most alpinists head to peaks above 6,000 metres for their altitude rather than their technical challenges, we looked into climbing those peaks that still required some technical skill but didn’t require the payment of the fee. However, we weren’t quite aware of the fact that a “trekking peak” is still a peak that requires climbing and technical skills. Climbing these peaks still requires alpine experience, proper equipment and some roping work. We learned these things the hard way. 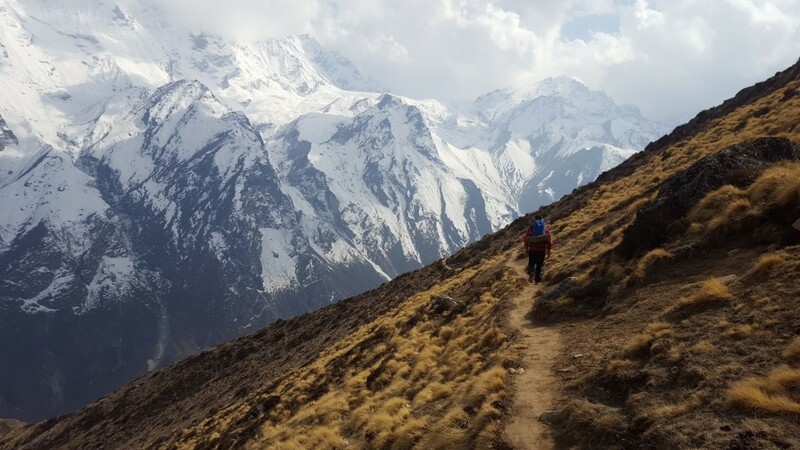 There are at least three very interesting trekking peaks that not do not require a permit to be climbed: Pokalde (5,794 metres) in the Khumbu region, Mardi Himal (5,587 metres) in the Annapurna Sanctuary, and Yala Peak (5,732 metres) in the Langtang region. 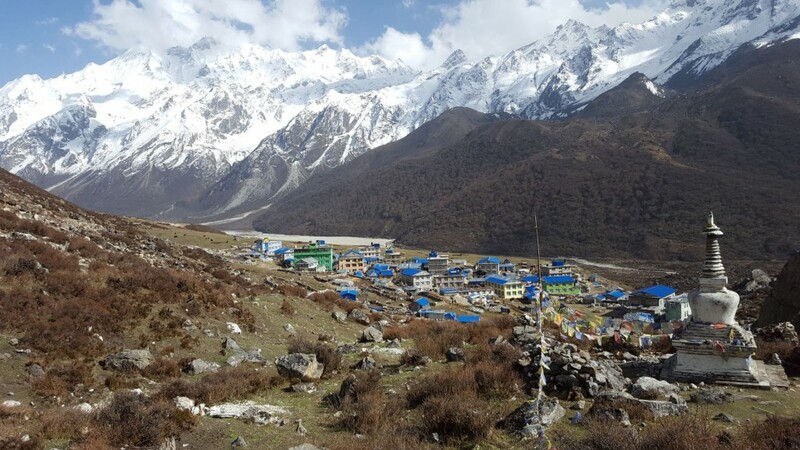 We were in Nepal for the third time and exploring the Langtang Valley for the first time. The beauty of this valley is that you see the high mountains from day one. 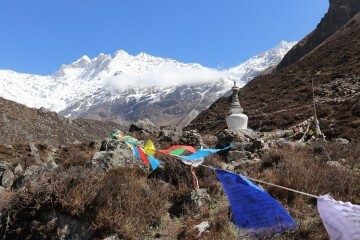 In two to three days, depending on your fitness level, you can reach Kyianjin Gompa (3,800 metres), a village surrounded by impressive mountains. This is where we found out about the possibility of climbing Yala Peak. The good news was that it was not considered a difficult mountain. 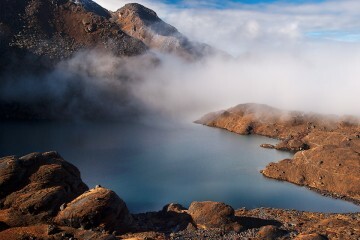 The bad news was that, like all trekking mountains, it required one overnight camp at the foot of the mountain. Asking around, we found gear to rent for our little expedition: a tent, gas, cooking stuff, rigid snow boots. It weighed a ton (in reality “just” 15 kg, but everything feels much heavier above 4,000 metres). We wanted to do it on our own, so we decided not to take a guide with us. So, off we went. We started by climbing Tserko Ri (4,970 metres), a peak that almost everyone can do. It is a long, strenuous climb, essentially 1,000 metres of uninterrupted uphill. We managed it in only three hours, despite the really heavy backpacks. The perfect weather gave us energy. All around us, the mountains revealed themselves little by little. From the summit of Tserko Ri we could finally see the other side of the valley, towards Tibet. 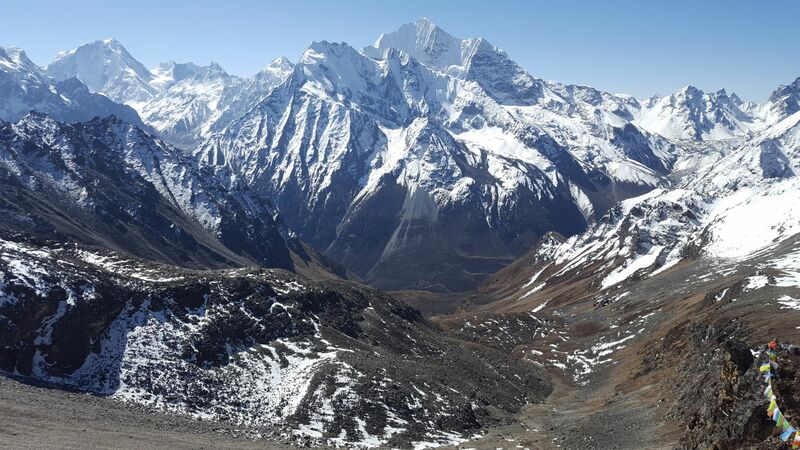 We knew that from Yala Peak we would be able to see the impressive Shishapagma, the one 8,000-metre-plus peak in Tibet. From here on, you need good orientation to find the camping spot and the peak. We couldn’t see the camp, which (we found out the next day) was lower and more to the east than where we were looking. 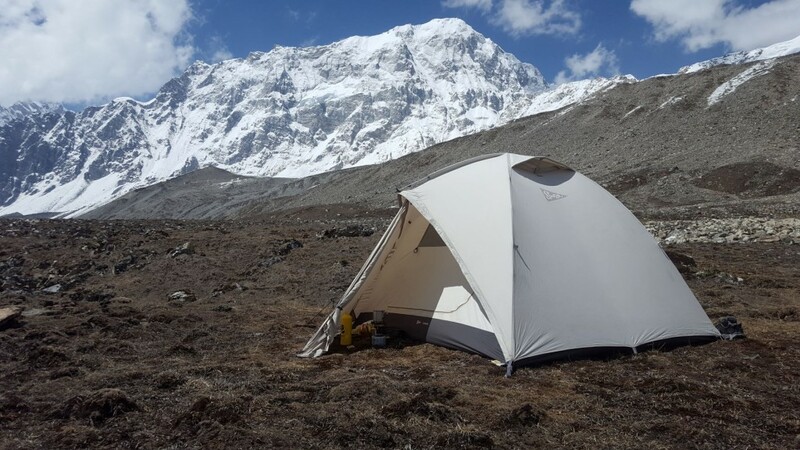 We decided to improvise our own camp and set up the tent at around 4800m, bellow Tserko Ri and on the route towards Yala Peak. There is no water source up there and, because we couldn’t carry too much, we went to look for snow to melt. We needed it both for cooking and drinking. It took us ages to set up the tent and cook. We were moving extremely slowly, as even the simplest tasks would take our breath away at that altitude. This was the second time we regretted not having taken a local guide who would have helped us with everything. The first time was when we realized we could not find the camp and we could not see the route. Surprisingly, we had an OK sleep during the night so we were optimistic in the morning. We saw some people descending on the south-east side of the mountain. The peak was in front of us, slightly to the right, but we had no idea where the route up was. We assessed the terrain and decided to attempt it on the side where we had seen the people coming down. Once we got there, the rock and snow seemed very unstable and steep. We traversed on the west side and walked up on snow, dodging some gnarly crevices until we found ourselves a few meters below the peak. The last meters to the peak were a very exposed, steep, scramble on friable rocks. We had no rope with us. It was the third time we regretted not taking a guide who would have known the route and could have roped us up. Although the peak was right there, a few meters above us, we turned around. It is important to know when to give up, before it is too late. Maybe we could have scrambled up that section, but we were not even sure we were on the right route, so we decided not to risk it. With heavy hearts, we returned to our camp, packed it up and headed down. On our descent we found the right camping spot, which was where we had seen the people going down. It was hidden from view by Tserko Ri. The lesson we learned was that “trekking peaks” should not be treated lightly. It is better to take a local with you, to show you the way and help carry equipment. Nonetheless, camping up there, by ourselves, trying to figure out a route up a 5,700 metre peak and making it almost to the top was an amazing adventure in itself. And of course, it goes without saying: the views are spectacular. We would definitely like to come back, this time with the right gear (crampons, ice axe, rope), more water and at least a porter to help carry everything.